With Homegrown Smoker Vegan BBQ opening a second cart (same menu) at the Green Castle food pod (and soon moving to Mississippi Marketplace), I thought it was a great addition for the area. 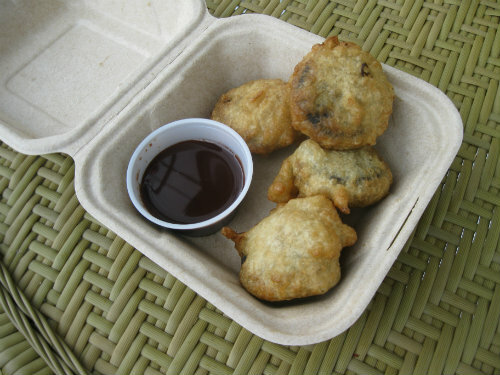 And then I saw coconut-battered deep-fried Oreos as a special menu item. Panda succumbed to the pressure. Had to get it. I remember having mixed reviews on the food the last time I went (last summer), but having a healthier option to traditional BBQ would ultimately get me back to this cart anyway. Thus, it seemed pretty natural that something deep fried would actually do the trick, right? Logic! And since we're getting these "fat-free" and "sugar-free" items (yeah, obviously not), let's add some chocolate syrup to the mix! Yay! In the coconut-battered deep-fried Oreos, I saw some real coconut shavings inside the batter after I bit in. The chocolate cookie portion of the Oreo merges with that infamous cream filling. It's soft and soothing, with a very slight fried crunch from the deep-fried coconut batter. Basically, the word "pandagasm" is appropriate here. So freakin' good. While Homegrown Smoker may run other entree and dessert specials, it may require some act of God to top this. This should seriously stay on the menu forever.